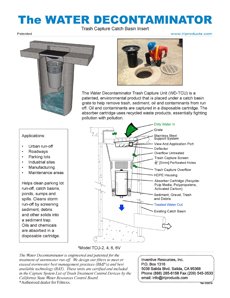 Since catch basins come in many shapes and sizes, some information is needed before a Water Decontaminator Trash Capture Unit can be quoted and ordered. The WD-TCU	has several standard sizes, but can be custom fit to any existing catch basin. Please completely fill out the appropriate sizing guide on the right before ordering. 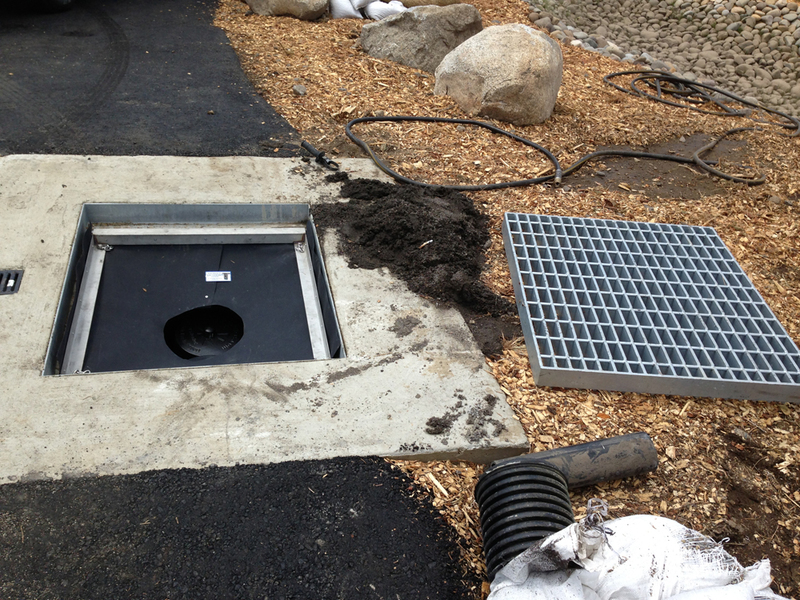 Including pictures of the catch basin and bottom of the grate is also helpful. To insure a proper fit, all the items on the form should be filled in. Cover style: There are several different styles of grates. Choose the style which is closest matches the drop ring or support ribs. OD: Outside diameter of lip. This is the measurement of where the grate sits when installed. ID: Inside diameter of opening. This is the smallest clear hole inside the catch basin. Take into account any rough concrete or restrictions. A: Drop ring dimensions. Most grates are flat on the bottom, but if it does have a drop ring or other reinforcement bars on the bottom these need to be measured to insure clearance for the WD-TCU support frame. B: Drop ring depth. Measure the part of the grate that extends below the lip it sits on. This is not the full thickness of the cover. C: Depth of catch basin. Measure depth from the grate to the top of the liquid level. Also note if there are any other issues that may need to be considered for fitment. For example access ladders, pipes or other restrictions. We are available by phone and email. Click here to download the Water Decontaminator brochure. Sizing information required to fit the WD-TCU to a rectangular catch basin with supports on only two sides. 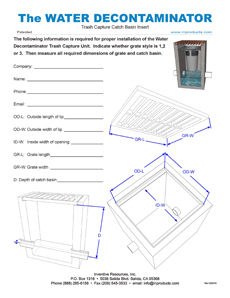 Sizing information required to fit the WD-TCU to a rectangular catch basin with supports on all four sides. 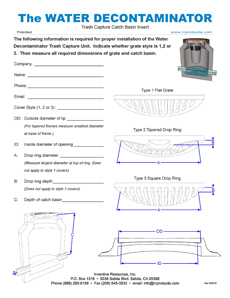 Sizing information required to fit the Water Decontaminator to a round catch basin.